To protect your water fountain investment, regular water fountain maintenance is required to prevent algae, water stains and blocked pipes from ruining the fountain’s look and function. How do you maintain and take proper care of a water fountain? Using Tap Water. When tap water instead of distilled water is used, corrosive spotting from hard water minerals can form, requiring frequent cleaning. Minerals from tap water can overwork the pump. Incorrect Water Levels. Overfilling or underfilling the fountain can lead to splashing, spilling, excessive noise and an over-worked pump. Neglecting to Clean Your Fountain. Daily light cleaning and monthly heavy, thorough cleaning of the fountain is recommended to prevent algae and debris build-up. Turning the Pump On and Off. The constant running of the fountain prevents the build-up of algae, bacterial and water minerals, keeping the fountain working properly. Turning the fountain on and off adds extra strain to the pump and will require frequent cleaning. Placing Fountains in High-Traffic Locations. Placing fountains in a high traffic area or along a narrow hallway can result in the fountain getting bumped. In addition, indoor fountains also have electrical cords which can be a tripping hazard if the fountain is placed far from an electrical outlet. Proper Fountain Set Up: The first step in water feature maintenance is proper set up according to the manufacturer’s instructions. In addition to proper fountain set up, additional measures include fully submersing the pump in water, regularly refilling the water, using distilled water and setting the fountain away from the sun. The fountain should be regularly refilled with distilled water to the specified level as too little water or too much water can result in spills and an overworked pump. Required Water Amount: Maintaining the water level is important for proper operation. Too much water will result in leaks and spillage. Too little water creates results a noisy fountain and pump wear and tear. The correct water amount will depend on fountain size and type as well as evaporation rate. Use distilled water, if possible. If distilled water is unavailable, there are fountain care products that prevent damage and discoloration. Additionally, a couple drops of vinegar or bleach into the tap water can work as well. Make sure your fountain is compatible with bleach use, as some fountains can become damaged. Avoid using bleach if the fountain is accessible by pets or children. Pump Maintenance: The fountain pump is what the makes the fountain produce bubbles and soothing trickles. Since the pump is what makes the fountain work, it’s necessary to regularly clean it to prevent clogs. Consistent, thorough cleaning of the pump is necessary to keep it working correctly. Knowing the normal noise of the pump can help alert you something is wrong if the sound suddenly changes. To thoroughly clean the pump, the fountain needs to be taken apart and the pump removed. Using a sponge or cloth, wipe both the outside and inside of the pump. For small, hard to reach places, use a toothbrush. If you find water mineral buildup on or inside the pump, try scrubbing with vinegar and water. Except when cleaning, leave the pump on. Turning the pump off and on causes damage. Routine Thorough Cleaning: A thorough cleaning will require emptying the fountain of water, taking it apart and using a damp cloth and gentle soap to scrub the inside of the fountain and its inner components like the pump. The basin and any rocks installed in the fountain should also be cleaned. Wipe the glass walls and the base with a soft cloth. Fountains made of copper, brass and glass will have different cleaning instructions. Fountain Maintenance: Maintaining your indoor water feature is easier than maintaining an outdoor one. Nevertheless, regular, routine indoor water feature maintenance is necessary. Correct assembly is the first step in maintaining your indoor water feature. Wall-mounted features should be level and hung where the fountain’s weight can be supported. Consult an electrician and place fountains close to an electrical outlet. It’s important to fill the fountain to the recommended amount as too little or too much water can cause problems with the fountain. Consistently refilling the fountain with lost water from evaporation will also extend the fountain’s life. Regular Cleaning Schedule: A regular cleaning schedule is important. Weekly or twice weekly quick cleaning and monthly heavy cleanings are recommended. Keeping to a consistent cleaning schedule can be helpful. Cleaning: For best outdoor water fountain maintenance, fountains should be cleaned once a week. Less frequent cleaning can result in dirt and grime build-up that becomes harder to clean and can affect the appearance and functionality of your fountain. Water Pump Maintenance: When the water level drops too low, the pump must work extra hard, causing excessive wear and tear. 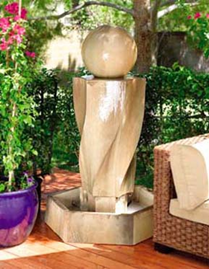 Outdoor fountains should be refilled or topped off at least twice a week due to evaporation. Cold Weather Considerations: When the temperature drops below freezing, it is a good idea to winterize your fountain. Drain all the water and either cover the fountain or take the fountain inside, if its small and light enough. Maintain the proper water level. If you have a free-standing bubble wall or bubble wall panels , regular cleaning is important. One of the ways to maintain your bubble wall or bubble panel fountain is to always keep it full. Check the electrical and tubing connections. After the water is at the appropriate level, make sure all the electrical connections are correct and working. Along with making sure the electrical connections are correct, check the airline connections for loose tubes or leaks. An issue with airlines will fail to produce bubbles. Clean the panels regularly. The panels need regular cleaning to remove dust and fingerprints. Though they are made of glass, glass cleaner contains harsh chemicals that can scratch the panels. Get rid of clogs. A clog can delay, slow or stop bubble output. It’s important to locate them and clean the clogged tube. Clean bubble wand tubes regularly . Water deposits and algae may build up on the bubble tubes. Regular bubble wall maintenance involves draining the fountain, removing the bubble wand tubes and cleaning both the inside and outside with a toothbrush. Replace broken or faulty parts. The sooner you get your bubble wall fountain fixed and the broken part replaced, the sooner you can enjoy your investment. 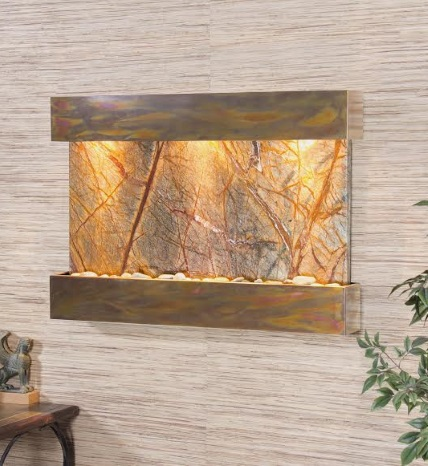 Water features make for great additions to your home or business. Outdoor and indoor water fountains as well as bubble walls require routine maintenance. Knowing how to maintain these water features will ensure many years of enjoyment. If you’re interested in bringing new life to a room or outdoor space, contact us at the Water Gallery with any questions you may have or to learn more about our indoor water fountain inventory and find the right one for you.